By Sara Nicole Ansari, R.D. In a large pot, sauté onions, celery, and ginger in olive oil until soft, about 3-5 minutes. Add carrots, water, and broth. Reduce to medium heat, cover and let simmer for about 30 minutes, or until carrots are soft. 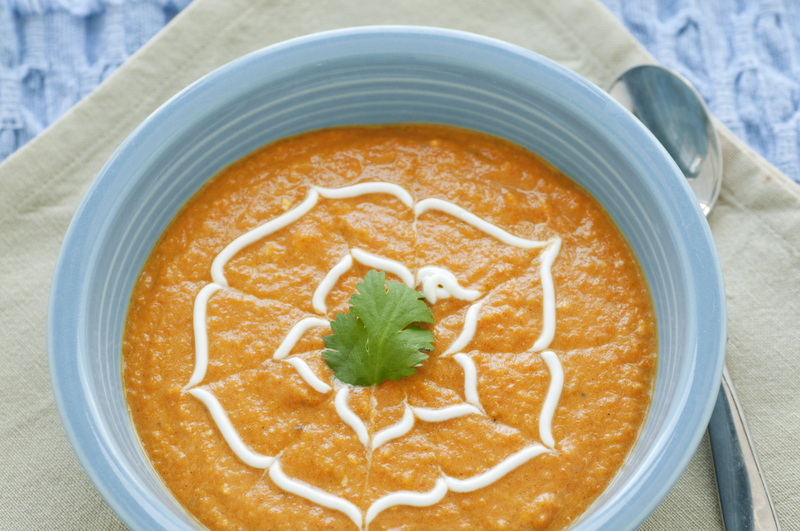 Working in small batches and using a food processor or blender, puree soup until smooth. Transfer back to the large pot. Season with sea salt and pepper to taste. Stir in milk or yogurt if desired for creaminess. Tip: I like to use a bag of organic baby peeled carrots to save time peeling and chopping. You may also use 2 lbs of carrots and 6 cups broth to make a larger portion. This works great if you want to make extra and freeze for leftovers. For an quick and light weeknight meal, just defrost and re-heat. For an added earthy flavor, add a sprig of fresh thyme to the pot at the same time as the broth and remove sprig before pureeing. Garnish with fresh thyme.